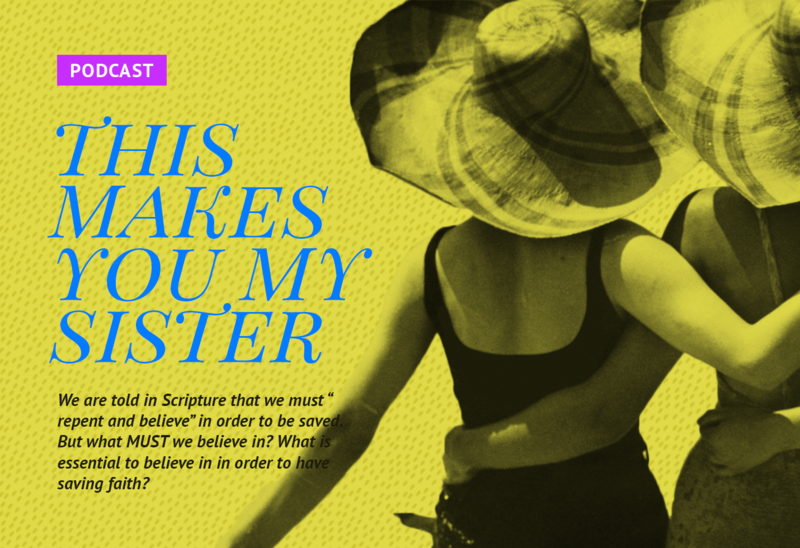 This week we talk about what the essentials of the faith are—what must one do to be saved? And when we say, “Repent and believe!” what must be believed in order to be saved? These are the things that make us sisters in Christ! 2:00 Big, huge news, followed by big, huge tears. 6:25 Why are we talking about the essentials of the faith? We outline what we think the essentials to SALVATION are, with a lot of qualifiers. 31:00 The Feminist of the Week brings up a discussion about social media use, obsession, awkwardness, & hypocrisy. Catholics do not believe in works based salvation. We believe that salvation is by God’s grace. Thanks, April, for clarifying that point as stated by Catholic doctrine. However, as I understand it, Catholic doctrine requires that the grace God saved us with be met with our obedience of His commandments in working out our sanctification throughout our lives. As I understand it, Catholic doctrine says it is the combination of God’s saving grace and our obedience to His commands which makes us holy enough to enter His Kingdom. This stands in stark contrast to the Biblical view, which states that by God’s grace, we believe in the satisfactory payment of our sins by Christ’s sacrifice and on the basis of that belief, we are adopted as brothers and sisters of Christ sealed by the Holy Spirit for entrance into God’s Kingdom eternally. Once saved, the Christian is to work out their holiness out of love of God for the justification which He has given us, resting assured that when we die we will be made perfectly holy and enter immediately into Heaven. So in short, Catholicism requires God’s grace plus the Christian’s works to make the Christian perfect, while the Bible actually says that God’s grace saves us, the Holy Spirit sanctifies us in this life, and God makes us perfect in the next life – perfect holiness has absolutely nothing to do with our human efforts. As a former practicer of Roman Catholicism you are spot on, Ross.